This series has to be the hardest title to Google that Marvel has released! So Magneto is having the X-Men and New Mutants train together. They all have silly versions of their names, for copyright reasons, I guess? It isn’t great. Luckily, Magik doesn’t have to suffer with any of that. Doug, Sigh-for, is nervous as he has no place on the team with his powerset. Magma, Smegma, yells about his thought balloon being too repetitive, which is funny. There is a quick conversation about how to pronounce, Magneto. Mag-neat-toe, is how I do it. British Psylocke, Bipsycle-locke, detects a message from the Offengers (Avengers) that they have been taken over by the Puppet Mister and the X-Men have to stop them. 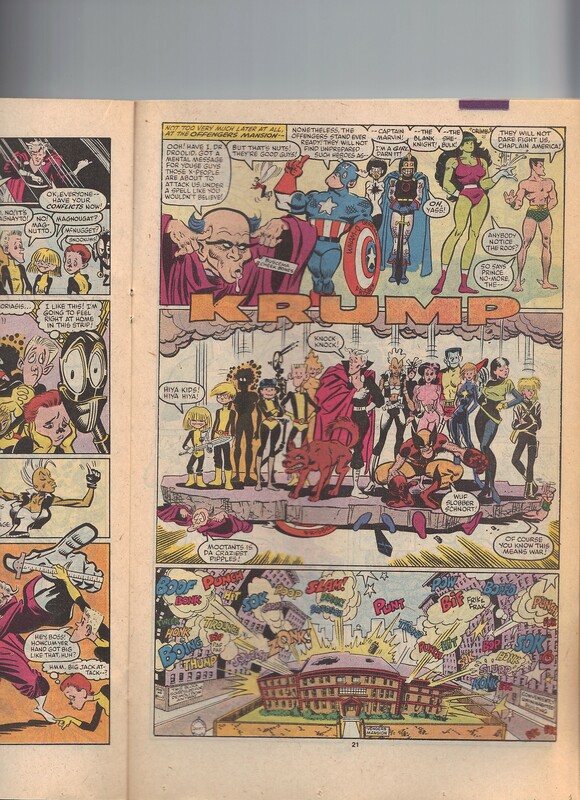 The Avengers are – Doctor Druid, Captain America, Wasp, Captain Marvel, Black Knight, She-Hulk and Namor. Not sure why the artist gave Magik vampire teeth (I guess because she is lord of all demons?) but at least she got her soulsword. So all the heroes fight. The Fantastic Four shows up. They are Thing, Human Torch, Ms. Marvel (not Carol) and Crystal. 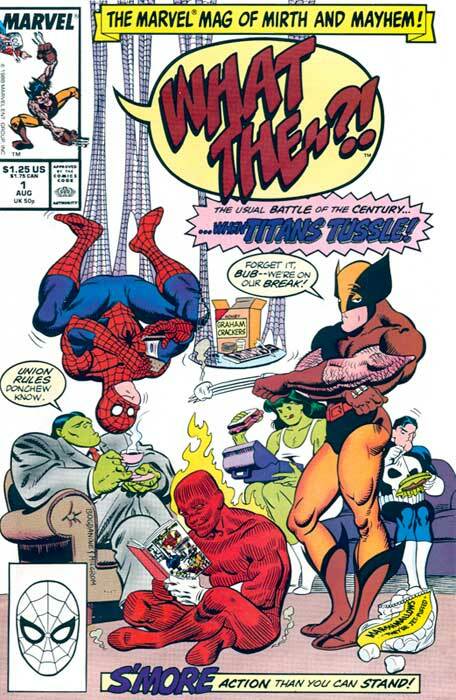 Then the West Coast Avengers (Guest Host Offengers) show up – Iron Man, Wonder Man (Wonderbread), Tigra, Mockingbird, Moon Knight (who moons them – something the character would never do!) and Hawkeye (Hawk guy) shows up. 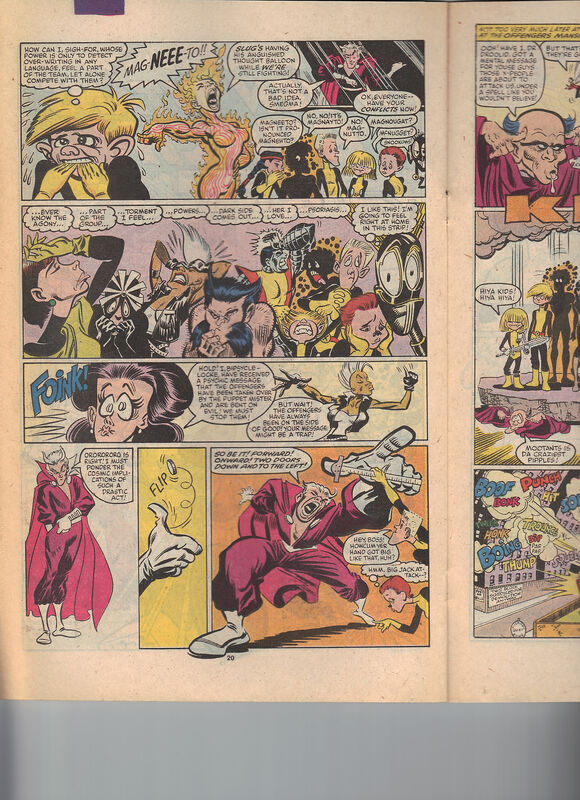 Even X-Factor and Alpha Flight show up. Then everyone else does too! Hulk, Spider-Man, Thor, Daredevil even. The Beyonder asks if this is part of Secret Wars III and they all stop what they are doing and tell him to leave. Captain America tries to get them all to use their words instead of their fists and he gets punched and elbowed by Wolverine and Spider-Man for his thanks. Story ends with the artist having an heart attack and the moral of the story is – Team Books Kill. The art is goofy but so is the story. Its fun and light and the names can be ridiculous but it adds to the story. I did buy the second issue at MileHighComics.com as part of my Father’s Day comics present, so I should be reviewing that one soon. I already own issues three and four but that’s it for me and this 26 issue series.